Corvara is a wonderful mountain village nestled in a green basin between the mountains of Sassongher, Sella and Boè and the plateaus of Pralongià and Col Alt. It lies in a sunny valley surrounded by ample meadows and green woods: a splendid location for every lover of the mountains of South Tyrol. 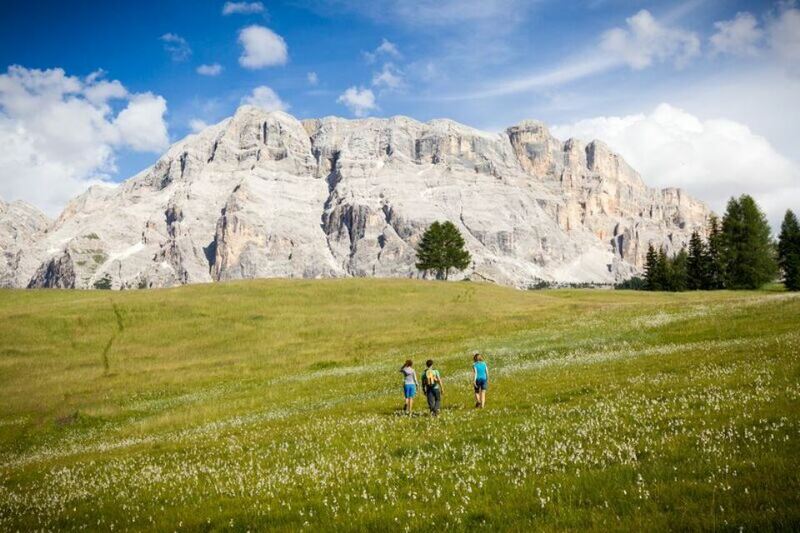 Corvara is the perfect starting point for various excursions, hiking trails and walking tracks. The routes starting from La Montanara and its surroundings are among the most renowned in South Tyrol and the Dolomites: the Pisciadù, the natural parks of Puez Odle and Fanes Sennes Braies (both part of the Dolomites UNESCO heritage area) and a lot more. Since the Maratona dles Dolomites is taking place in Alta Badia, the area has become a sanctuary for the mountain bike and cycling lovers. The Dolomites around Corvara offer a wide array of tracks for every kind of biking enthusiast: tours for the whole family through the woods and meadows or the steep passes which host most difficult stages of the Giro d'Italia. During the Sella Ronda Bike Days the passes are even closed for cars, allowing bikers to enjoy a whole car free day on the most beautiful mountain roads of South Tyrol. Rock climbing areas, sports fields, tennis fields, biotope lake, archery field, animal park in Colfosco, indoor ice stadium opened in the summer represent the ample offer of summer activities in Corvara. And then there are the numerous bars, restaurants, inns and shops studding the streets in the center of the village. In the pavilion of the town square various cultural and folkloric performances are offered for the enjoyment of the guests of Alta Badia.